This month a children's activity book, produced by West Coast Aquatic, is being released. Starting with a simple idea and a few conversations, this book evolved into a community project involving lots of people and fun. It is all part of a series of highly popular items produced by West Coast Aquatic, including the 'sea creatures' language webpage, the Cox Bay webcam, www.westcoastaquatic.ca, as well as a native language poster series and other materials celebrating west coast culture. 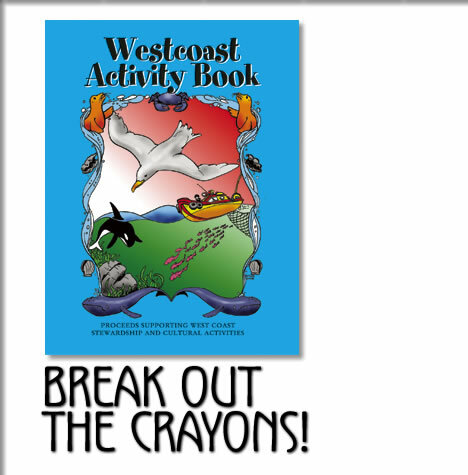 This Westcoast Activity Book is designed to be fun for all ages and is made for any kid who loves colouring, word puzzles and games. The theme is coastal with everything from beaches, birds, and whales, to waves, boats, and surfing. It engages you and your children in fascinating, educational, and creative activities--all designed by west coast people who love, live, and work in the beautiful part of the world. You kids will find out why humpback whales blow bubbles, why tufted puffins are terrible flyers. They will learn how one sea star can become two, why sea otters never get wet, they can try their tongue at the Nuu-Chah-Nulth language and much much more! In addition to many other talented west coast artists, the book features the works of Mark Hobson, the photographic talents of Jeremy Koreski and John Forde, and the literary talents of Ron Weeks and Sandra Dale. West Coast Aquatic is a non-profit organization whose objective is to ensure opportunities for coastal communities affected by aquatic resource management. All proceeds of the book will support research in our waters.